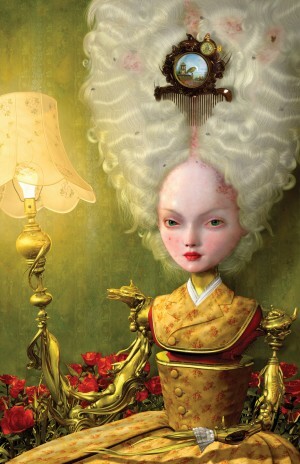 Today we want to introduce you to an extremely eccentric artist – Ray Caesar. Ray Caesar was born in London, in the family of four children. Soon, for the sake of the creator referred to as the “intolerant neighbors” moved to Canada. As a little boy Ray Caesar used to draw on the walls, on the floor and saw the world through slightly different eyes. ,, When I was a kid I used to talk with furniture and I am quite sure that they talked back to me.” – Says the artist, from childhood suffering from multiple personality disorder. After graduating from Ontario Art and Design University Ray Caesar worked with children in the Art department of hospital in Toronto. Images seen through those 17 years of work greatly affected artist. Once he seen murdered child photography. Sensitive soul artist was very shocked. He used to draw, redraw and promptly burned this image. It was a sign that hospital should be left. Artist admits often waking up in the middle of the night and understand that in dreams he was wandering in the corridors and lounge of a huge hospital, where his volatile imagination was born. In one of those dreams, once he seen his mother. In this dream she encouraged him to exhibit his woks.